Estonia plans to be for oil shale mining what Canada is to tar sands. Since well before the Second World War Estonia has mined, extracted and consumed both energy for electricity and oil from shale. By far the earliest country to commercially produce oil shale into fuel, Estonia's Eesti Energia and subsidiary Enefit have been looking to move into many countries around the planet in the name of both oil production and electrical plant operations from kerogen-based shale. Estonia's role in the expansion of extreme extraction may be among the most significant on the planet given the scale of carbon emissions and the deposits Enefit seeks to exploit. There are two main deposits, both mined heavily, including one that straddles the Russian Federation. 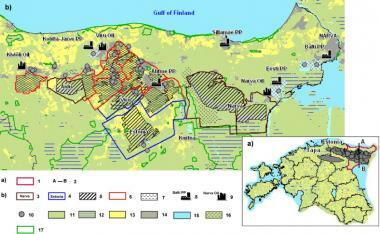 Approximately 16 billion bbl in place on Estonian territory; 2.5 billion tonnes of oil shale in the earth. Mining for oil production and feed stock for electrical power plants. Open cast and underground mining takes place at several separate mine sites, primarily in the northeast of the country. The world's two largest shale-fired power plants exist in Estonia; the industry has been extracting oil from shale (through mining and heat-retorting) since WWI. The first oil from shale locations were in Estonia and today only China and Brazil have independent commercial developments similar to Estonia. No large scale in-situ operations currently exist. Projects continue to provide electricity beyond the borders of Estonia, including St Petersburg (former Leningrad). Oil extraction from shale is now part of Eesti Energia's local and international mandate; EE is expanding into a major international energy player as technological innovators. Continued expansion is underway in China, the United States (Green River Formation) and a host of smaller countries. EE predicts 20 000 bbl a day of synthetic oil in Estonia alone by 2016; this is in addition to over 95% of the power grid for Estonia's electricity being supplied by shale from one of the various above and underground mines in the country. Electricity can be sold beyond Estonia's borders. Locally Estonia suffers from severe lack of environmental oversight; The oil shale led energy industry accounts for the vast majority of air pollution and further has massive impacts on water, land and the climate itself. Internationally Eesti-Energia of Estonia is taking on a disastrous role as the leading edge of climate destruction. Perhaps inspired by the rise of tar sands mining, extraction and development expansion both inside and outside of Canada, Eesti Energia has begun a major international push of promoting and providing technology and capital to begin oil shale mining projects for both power plant electricity and oil from shale plants in many corners of planet. The largest possible oil reserve on the earth-- the Green River Formation of Colorado, Wyoming and Utah in the United States-- now has an Eesti Energia research and development operation, along with development plans or proposals in (and not limited to): Serbia, Jordan, China, Australia and Morocco.